Driven by my love of minimal Scandinavian style we've gone for all-white walls in our new house, but that's not to say that I don't like seeing walls with colour. In fact right now I'm really loving walls painted pale pink or grey. When I came across this home via Design*Sponge recently, it was the two-toned walls that immediately grabbed my attention. Designed by JHID, whose work I greatly admire (I've featured another one of their homes here) lead designer Chelsie Lee used a modern combination of white and grey, but as you'll see below, it's the way the paint has been applied that creates visual impact. Notice above how the grey paint lines up with the headboard and is taken up and over the ceiling, continuing down the opposite wall (see below). By adding depth and contrasting with the white paint, this cleverly accentuates the window area. When I first saw the image below my eyes were drawn to the beautiful curtains and light coming through the window. The grey wall adds another layer visual interest, highlighted by the gorgeous cut glass and hanging terrariums. 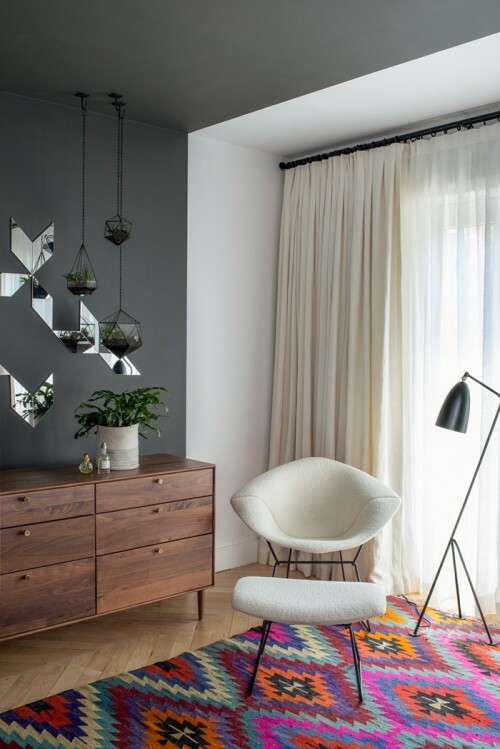 Beautifully elegant furniture, a colourful rug, bench seat and cushions add the finishing touches, making this bedroom an absolute winner! The white and grey colour blocks continue in the living room above and also in the light-filled stairwell below. Bold yet still soft, I love how the grey looks against the fresh white paint and blonde wood in this light-filled area. 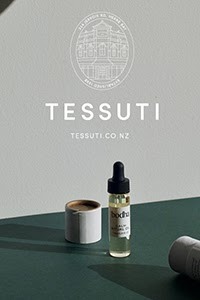 Such a simple yet clever idea, I predict that after seeing this home, people will be rushing to grab their paint brushes in order to replicate the look. I may even do the same if I ever tire of our white walls! This next image was the inspiration for this moodboard I created last year, and it has stuck in my mind ever since. 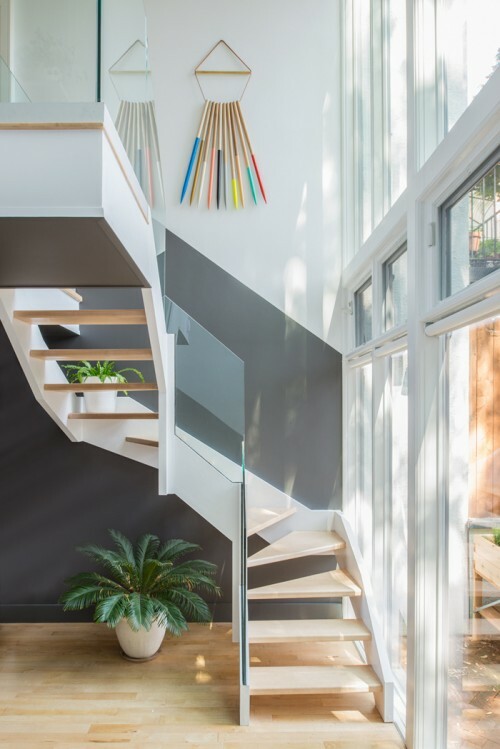 Designed by Incorporated, a multi-disciplinary architectural studio in New York, I love the way the wall has been painted a charcoal colour, creating bold lines and a striking contrast against the the white painted stair. 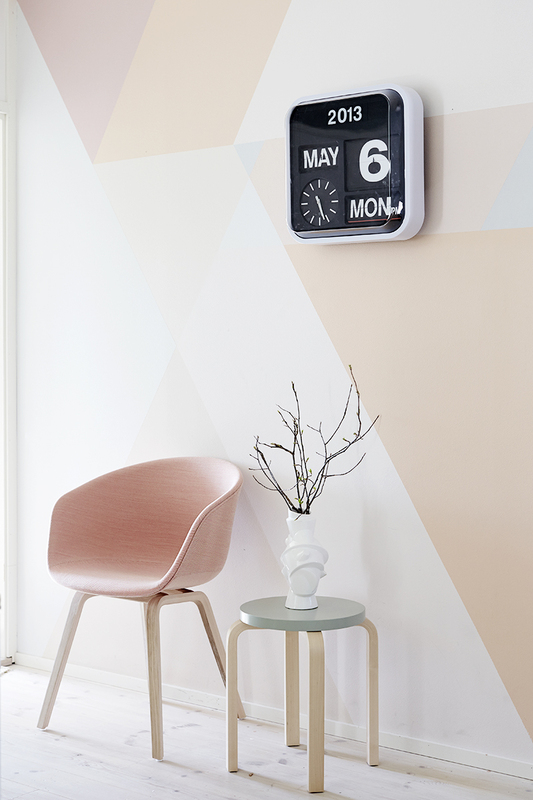 The super talented RiikKa of Weekday Carnival designed this geometric wall, and with the help of her husband painted it in pastel hues. The result is breathtaking! Whereas painting one feature wall was once a popular trend, nowadays we're seeing more of a sectional approach to applying paint colour. The living room below is a great example. While the pink adds a lovely soft touch, the doors, fretwork-detailed ceiling and windows have been left white, allowing the classic, character features of the room to shine through. Paint colour can also help define areas of the home, especially in open-plan and compact spaces. This gorgeous turquoise wall, along with the bookshelf, accentuates the small dining area. 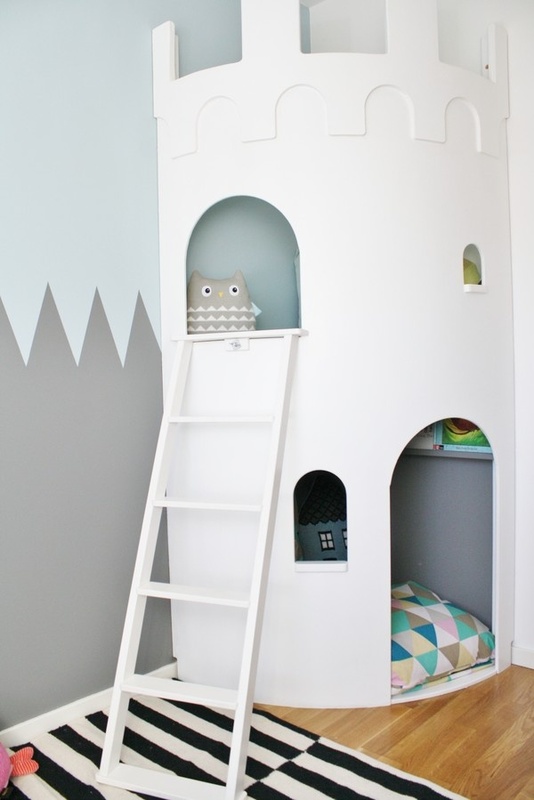 A fun idea especially for a kidsroom, as demonstrated with the green paint in this Inspiring Home Post last week, is to paint a door in a contrasting colour. 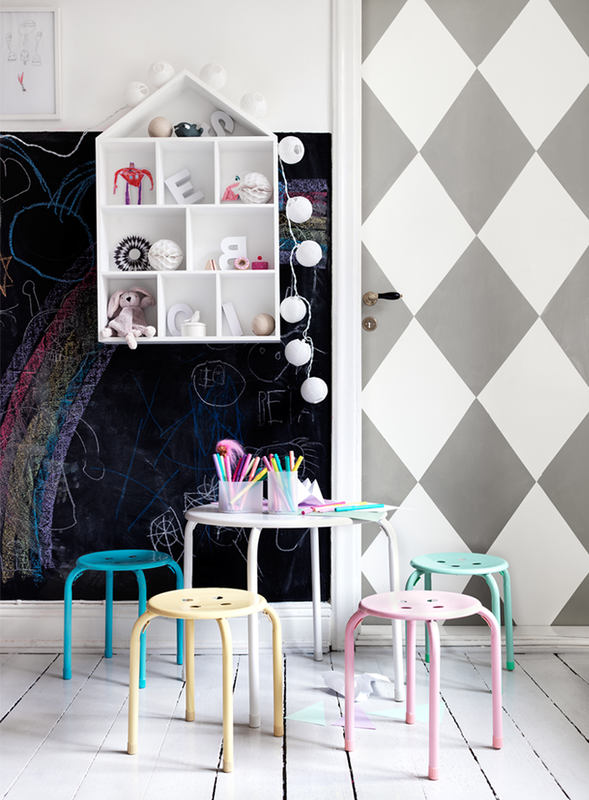 The kidsroom above has a cute checkered door and a section of chalkboard paint on one wall, while the playroom wall below has been personalised with pastel blue and grey paint. 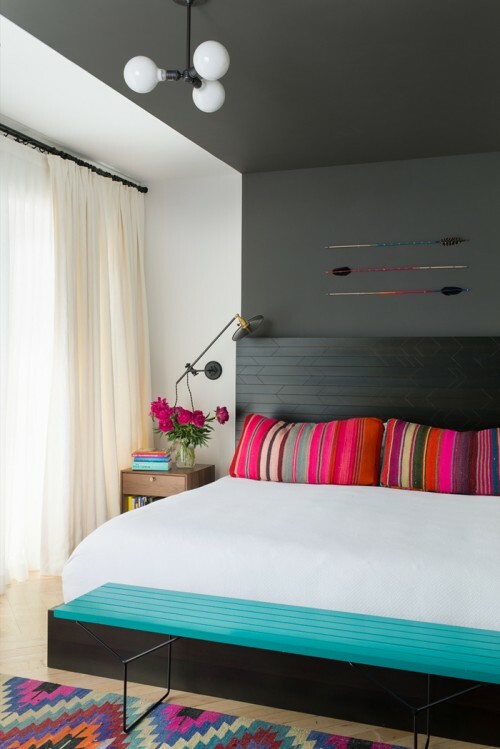 Love these styles of rooms where they use two tones. Especially in rooms where its open plan. It makes the room seem more homely, and helps divide it up a lot better. Beautiful rooms!Any chance you know where the gorgeous pendant light in the first pic, and the wooden decorative piece in the fourth pic(of the staircase) are from? ahhhh I'm a sucker for the dark grey with the pops of color! to die for. Very beautiful design.when I see one of them,coming to different world. 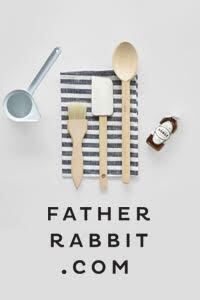 I really like this all white design, we are redecorating the house great tips!